Cyber Crimes | What’s new on the web? Posted by cyberpatrol in Anonymous, cyberbullying, myspace. n the case we’ve come to call the ‘MySpace suicide’ case, how important is the ’suicide’ part? It appears that U.S. District Judge George Wu believes it’s not critical, and is leaning toward excluding the evidence of how 13 year-old Megan Meier hanged herself. “I don’t necessarily think the suicide is relevant to the crime charged,” Wu said, according to the AP, adding he thought details of Meier’s death would unfairly prejudice the jury. He said he planned to announce his final decision Friday. The trial is set to kick off next Tuesday. Exclusion of the suicide would, of course, be a setback to the government. It would also highlight the divergence between the facts and the law. As Dean Steward, the lawyer for defendant Lori Drew, told us last week, the trial will be in two parts: the legal side, such as what the Computer Fraud and Abuse Act means and whether it can be triggered by violating the MySpace terms of service; and the factual side, the tragic death of a 13 year-old girl and the question of who caused it. In what strikes us as another interesting twist to the upcoming trial, Steward attempted to waive Drew’s right to a jury trial, but prosecutors refused to assent to the waiver, resulting automatically, according to the AP report, in a jury trial. The prosecutors’ refusal to accept the jury waiver likely came as a surprise to Steward. 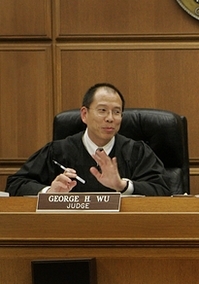 Last week, he told the Law Blog he suspected the prosecutors would not oppose the jury waiver for fear of offending Judge Wu. Posted by cyberpatrol in cyberbullying, myspace. Lori Drew, accused of cyber-bullying a teen who later committed suicide, tried but failed Wednesday to get a federal criminal case against her heard by a judge instead of a jury. Her lawyer, H. Dean Steward, said she waived her right to a jury trial but that prosecutors, whose agreement is required, refused. St. Louis area prosecutors had said they found no charge applicable to the circumstances. But the U.S. attorney in Los Angeles obtained an indictment in May that charged Drew, formerly of Dardenne Prairie, with unlawfully accessing MySpace computers in the process of harassing her daughter’s rival down the street. Steward also is trying to keep any mention of the 2006 suicide of Megan Meier, 13, out of the trial, which is set for Nov. 18. Posted by cyberpatrol in cyberbullying. Teens from across Vermont were in Montpelier Thursday to learn about the effects of cyberbullying. One of the people they heard from knows about the effects first hand. John Halligan’s son Ryan would be about the same age as some of the high school students he spoke to. “A wonderful sweet, gentle, kind, empathetic boy…I mean he was the kind of kid that he made friends quick. People liked being with him but there was a vulnerability of Ryan, he was a bit of a sensitive kid,” Halligan said, describing his son. Ryan Halligan, 13, was a middle school student in Essex Junction, Vt., when he commited suicide in 2003. After his death, his father John discovered he was being bullied online, through instant messaging in the months before his death. “I think they feel a lot more comfortable in a cyber space world to do things that are far more detrimental and far more damaging to the well being of a peer, because there is no immediate accountability or consequence,” Halligan said. Halligan works to make children and teens more aware of cyber bullying by sharing his son’s story like he did at A World Of Difference Institute on Thursday. Tony Sulva, a senior at Champlain Valley High School, says it’s an important issue to talk about as he worked with some of his peers at the event. “It’s not really saying it to the actual person, but really it’s kind of the same communication, just not face to face,” Sulva said. Sulva also said there are many forms of technology used for bullying. “Email, cell phone texting, instant messanger, and web sites like Facebook and MySpace,” Sulva said. A bullying prevention law was passed in Vermont in 2004, and Halligan said the laws are evolving, but aren’t the complete solution. Posted by cyberpatrol in 4chan.org, cyberbullying. On October 3rd, a rumor that Apple CEO Steve Jobs had a heart attack sent Apple’s stock crashing down from $105.04 per share to $94.65 per share, equaling a loss of $9 billion in market value. All that in just 10 minutes. That shows how important Steve Jobs is to Apple. It also shows how fragile the market is at times. Generally, when a fake news story has a substantial impact on the value of a company’s stock, the SEC gets involved. And that’s just what they did this time. Manipulating the value of a stock for your personal gain is a crime with some hefty penalties, so the SEC tried to trace the story and see if it’s originator had any financial reasons for starting the rumor. It turns out he didn’t. The story made it’s way to CNN’s iReport.com, which is where it really started to hit the mainstream news, but it’s origin was a tad less respectable: an 18 year-old kid posting on 4Chan as a prank. Posted by cyberpatrol in Anonymous, cyberbullying, Hacking, stalking. There’s a whole world of people out there, and boy, are they pissed off. On political blogs, the invective flies. Posters respond to the latest celebrity gossip with mockery or worse. Sports fans set up Web sites with names that begin with “fire,” hoping coaches, athletic directors and sportscasters lose their jobs. And though there are any number of bloggers and commenters who attempt to keep their postings and responses on a civil level, all too often interactive Web sites descend into ad hominem attacks, insults and plain old name-calling. Indeed, there are even whole sites devoted to venting, such as justrage.com (one screed there was titled, “I don’t give a flying f***, so f*** you”) and mybiggestcomplaint.com. This is not a world Emily Post would want to be caught in after dark.